Bows to FDA demands; good for NY and MD? DNA testing company 23andMe yesterday suspended its health-related testing in compliance with an FDA directive issued last month. Ancestry-related DNA tests will continue without interruption and raw genetic data will continue to be available as well. The Legal Genealogist wants to repeat that: Ancestry-related DNA tests will continue without interruption and raw genetic data will continue to be available as well. In other words, the 23andMe sky is not falling when it comes to genetic genealogy. And, in fact, if you’re from New York or Maryland, this may be very good news for you. If you bought a test kit from 23andMe before the FDA issued its directive, you’ll get all the results previously offered, including health results. If you bought it afterwards, you’ll get ancestry-related results only. If you’re unhappy enough about that limit that you want your money back, 23andMe says it will offer refunds to new customers. So how did 23andMe come to this? Yesterday’s suspension of the health testing was the inevitable result. So what does this mean for us, as genetic genealogists? For the time being, nothing bad. 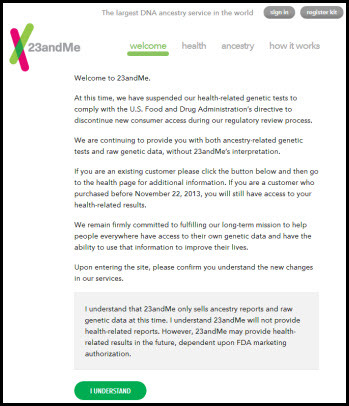 As predicted, the FDA isn’t shutting 23andMe down,13 and we can continue to use 23andMe for ancestry testing. In fact, there may be one surprisingly good result for some folks: laws in New York and Maryland that impacted 23andMe tests because of its health testing aspects14 suddenly don’t apply any more to this ancestry-only test. The 23andMe website doesn’t say that yet — but it’s crystal clear that the only reason why those laws affected 23andMe was because of its now-suspended health test. For ancestry testing, there’s no reason as of today why New York would insist that the test itself be taken outside of New York (so no more taking the kit across the river and mailing it back from New Jersey!) and no reason why Maryland would forbid the test without a doctor’s involvement. I expect that, as an ancestry-only testing company, 23andMe will start accepting kits mailed from New York and start selling kits in Maryland in short order. Whether 23andMe can survive as an ancestry-only testing company long enough to resolve its differences with the FDA is another matter altogether. Personally, I wouldn’t hesitate to go ahead and test with 23andMe right now since the test is so inexpensive. The $99 cost to fish in the 23andMe pond, even for ancestry only, is worth it. Great review, and good catch on NY and MD! Although people in these states did find ways to test before, this will open the door for many people. I’m also thinking that 23andMe might put some new R&D efforts into the ancestry side of the test. At least in the short term, there’s potential for this to be a big benefit for genetic genealogists. I would LOVE seeing some serious resources put into ancestry R&D, Blaine. If we saw that, I’d have a lot more confidence about 23andMe’s intentions on that side of things for the long run. It’s always seemed to me that ancestry was the poor little red-headed stepsister to health at 23andMe. I don’t know if I’d bet on NY or MD just yet. Say that the FDA and 23andMe eventually come to terms about what is acceptable marketing from the FDA’s perspective. That doesn’t mean that the same will ultimately be acceptable from either NY or MD’s perspective, though I don’t know the specific statutes or regulations that NY and MD rely on to ban spitting within their borders or if some FDA ruling could effectively act analogously to a safe harbor. I wouldn’t think so; some US places remain dry even though we have a 21st amendment. In any event, couldn’t NY and MD simply assert that 23andMe’s intention is to use the test for health purposes again even though they are currently precluded from doing so? Do NY and MD have an issue just with the interpretation part of 23andMe, or is their issue with submitting DNA at all? NY and MD right now are addressing only the health issues, and so there is likely going to be a window of opportunity here. Both states speak only in terms of health testing; they do not regulate ancestry testing at all. So could the states regulate this? Probably. Will they? Probably not. And I think 23andMe is likely to be well within the law of both states by accepting kits for ancestry testing at this time. Judy, I agree about 23andMe’s attitude on ancestry. In the recent commercials and other marketing, most of the focus was on the health side. The v4 chip reduction from 967,000 SNPs to 600,000 – 700,000 SNPs hasn’t been adequately answered by 23andMe, but some believe the SNP reduction will fall largely on the genealogy side. Not looking forward to that if that’s the case, Paul. Calling what 23AndMe offered a “health test” is a reach. What they offered was a statistical information service that gathered information on health-related issues and offered interpretations of those issues. Now if you want to know that same information, you will have to determine what research pertains to your particular genetic data, find the studies, and interpret them, a Herculean task. Thanks FDA! I have to wonder if the FDA’s actions were prompted by self-serving physicians looking to guard lucrative genetic testing practices. It is also doubtful that any one doctor would be able to provide the breadth of information provided by 23. I note that the FDA has chosen not to ban cigarettes, something proven to cause cancer, yet they stick their nose into an information service. Plain out-and-out overreach. It’s an “overreach” invited by 23andMe, which applied for FDA approval and then failed to follow through. Somehow everyone seems to be forgetting — or ignoring — that minor little detail. Judy, you are one of the few who hasn’t forgotten or ignored it and I appreciate it. I feel like a lone wolf when I make the point. It seems as though nobody wants to even consider that 23andMe brought some of this down on its own head. So? If a candymaker applies for FDA approval of its candy as a health remedy, and it is not deemed to be such, does that mean the FDA has the right to tell them to quit making candy? No. It seems to me that this is an FTC advertising issue, not an FDA issue. Clearly the FDA’s actions are overreach. 23AndMe has the right to compile and distribute gene-related health information along with health-related statistical probabilities. Disseminating this information has NOTHING to do with the FDA. Free speech anyone? My guess is the FDA’s actions were driven by self-interested medical professionals. Genetic testing is a lucrative field. But, anyway, it’s too late. The FDA is spitting in the wind. Consumers taking control of their own genetic health information is a given. Why doesn’t the FDA ban cigarettes if they are so intent on guarding people’s health? The FDA is the FTC of health stuff. Its job within its statutory limits (which is why it isn’t allowed to regulate tobacco but only require warnings) is to ensure that health claims are accurate. Like it or not. It’s not the product (the actual genetic test & raw data it produces), it’s the marketing claims, specifically the health-related marketing claims, and the inclusion of health-related interpretations in their reports, that caused the FDA to raise the level of involvement. The exact same test can be sold, without the health-related marketing claims & without the health-related interpretations in the report, and nobody will object. The fact is, this was already being done by other companies in the US…: the FTDNA and Ancestry tests have thousands of health-related SNPs included, but they don’t market this fact or give interpretations in their reports, so it is not relevant. 23andMe has now brought themselves to this same position, for the moment. You are exactly right: it’s the marketing and the claims, not the test, that’s at issue. While I do agree that 23and me could have done better with their response to the FDA’s warning letter, it still seems that some of the consumers power to make decisions and options is being curtailed if not limited all together. I can’t help but think that some of this was prompted by the recent spate of celebrities taking charge of their own health after possibly genetically inherited conditions or traits were discovered through DNA medical testing. Angelina Jolie being the most notable. $99 is a bargain to find out how to best proceed as an informed consumer. That same testing done in a medical office by medical personnel could conceivably cost thousands of dollars, thereby putting it out of reach for millions of americans. I didn’t use 23andme for my ancestral genealogy research, but I am sure there is a disclaimer that the test is not meant to diagnose, treat or otherwise be a substitute for adequate medical supervision. There is abuse in the most simple products on the market, so I don’t think a cost effective tool in our arsenal of health monitoring should be taken off the market because of the possible abuse by a small minority of people. Then the fda should also go after everything in your local gnc or vitamin shoppe. Maybe it should! But the agency has picked its battles. And read the FDA’s letter to 23andMe, please. The worst outcome of this whole business may be the loss of competition in the DNA field. 23andMe initiated the price competition war with their $99 autosome test. FTDNA which was used to have a monopoly had to match. Notice FTDNA keeps their Y & MT prices high which 23andMe doesn’t do. On the other hand, maybe 23andMe will cut their price to survive. Who knows? Loss of a competitor never helps the user. There’s no doubt that losing 23andMe would be a real blow. Let’s hope it doesn’t come to that.